Schultz got on the board early with a minor for elbowing in the first period. 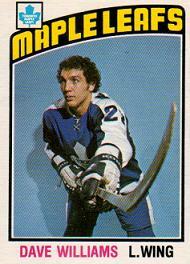 As Toronto jumped out to a 4-1 lead in the second Schultz dropped the gloves with Maple Leaf forward, Scott Garland. 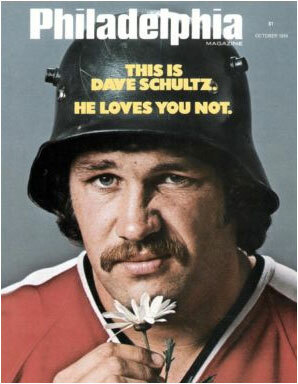 Each received majors for fighting after a major league battle that left Schultz with a cut near his right eye. Garland and Schultz picked up 10-minute misconducts after they refused to separate and each threw shots over the linesmen’s heads. In the third period Schultz piled up 25 minutes in penalties during one altercation with Leafs enforcer Dave “Tiger” Williams. Tiger was a bad man, almost as bad as Schultz himself. Williams finished his career with a record 3,966 penalty minutes. The brawl started with Williams and Bobby Clarke exchanging high-sticks. Schultz quickly arrived at the scene and paired up with Williams. In the fight, the only one ever between Schultz and Williams, the combatants spent most of it locked up in close quarters. When they were finally separated Schultz thumbed his nose at the Maple Leaf Gardens crowd as he left the ice. For his role in the fight Schultz received a fighting major and a double game misconduct. Williams was also tossed with the always ignominious Gross Misconduct. After the game Flyers GM Keith Allen brought Clarence Campbell into the locker room to show the NHL President a bite mark Schultz had received from Williams during the fight (hard to believe they never mixed it up again). The Flyers defeated the Maple Leafs in seven games on their way back to the Stanley Cup finals for a third consecutive year. Below is a video of the fights from the game.